Aside from restoring the good name of the dinosaur and pointing out that they still exist (birds are descended from them), Lacovara also argues that they are a key to studying the future of climate change: Their fossil records provide us with a history of the planet as it dealt with various environmental tipping points. Lacovara joins Ira to share his awe and never-ending amazement for the dinosaurs. Plus, Karen Chin, curator of paleontology at the Museum of Natural History at the University of Colorado, Boulder discusses new research that suggests some herbivores may have had a more diverse diet than previously thought—including a hankering for crustaceans. Karen Chin is an associate professor in the Department of Geological Sciences, and Curator of Paleontology at the University of Colorado Museum of Natural History in Boulder, Colorado. IRA FLATOW: This is Science Friday. I’m Ira Flatow. What words come to your mind when you think of dinosaurs? Intelligent? Highly adaptable? Maybe not. To most people they are known for being creatures brought to their knees by a massive meteorite. Not exactly a success story, right? But my next guest says the dinos were really good at one thing– being dinosaurs. After all, they were around for a better part of 165 million years. We’ve only been around a million or so, and they are still around out there alive today. Joining me to tell us why dinosaurs matter, which also happens to be the name of his latest book, is paleontologist and geologist, Ken Lacovara, Dean of the School of Earth and Environment, Director of the Jean and Ric Edelman Fossil Park at Rowan University, as I say author of Why Dinosaurs Matter. Welcome back. IRA FLATOW: That’s a great book. KEN LACOVARA: Well, thank you. I’m glad you enjoyed it. IRA FLATOW: You go through the whole history and what we think about dinosaurs. And why do you think dinosaurs need defending in your book? KEN LACOVARA: Well, you know, if you open any of the major English dictionaries and you look at the definition of dinosaur, there’s the biological definition. That’s number one. Always number two is a definition about something that is obsolete. Something that failed to adapt to changing conditions. And you know, it’s used as a pejorative. You can open a newspaper almost every day of the week and see this company is a dinosaur or this political party is a dinosaur. And I always think, they should hope to be so lucky, right? Global dominance for the better part of 165 million years. What CEO wouldn’t dream lustly about franchises spreading out across the globe like dinosaurs did? IRA FLATOW: What is the exact definition of a dinosaur, and what gives them their dinosaur-ness? KEN LACOVARA: Well, there’s two definitions. One definition has to do with their anatomy. And so we have a number of features that you have to have to have or your ancestors had to have had to be considered a dinosaur. And most of those have to do with their upright stance, and their straight ahead forward motion, and their vigor that they possessed. And then there’s what we call the phylogenetic definition, right? Family trees. And so you go back in the fossil record, and you see the first thing that qualifies as a dinosaur, and you take 100% of that animal’s descendants, and that is the group dinosaur. IRA FLATOW: And of course, you point out many times because it looks like you don’t want us to forget that dinosaurs are still all around us. KEN LACOVARA: Yeah, that’s right. If you have the first dinosaur for an ancestor, you’re a dinosaur. And being a dinosaur is a binary condition. There are no degrees of dinosaur-ness. If I asked you the question, what’s more of a mammal, a hippo or a chimpanzee, right? They’re the same. They’re mammals. And so if you’re in that group, you’re in that group, and you never leave the group. And so birds are in that group. Birds can trace their ancestry back to the very first dinosaur, just like a T. Rex can, just like a Stegosaurus can. IRA FLATOW: I remember when people first started talking about this. Somebody probably from the American Museum of Natural History, which really celebrates the bird-ness. The dinosaur’s a bird. They said, take– have chicken dinner tonight, and take one of the bones from the chicken, and go to the museum, and hold it up against the dinosaur bone, and besides the size, it’ll look exactly the same. KEN LACOVARA: That’s right. And when you really start to study dinosaur anatomy, you begin to see the Velociraptor in the turkey. IRA FLATOW: So what happened with the sizes? Why are dinosaurs so big in the first place? KEN LACOVARA: Well, remember. Dinosaurs are also tiny. There are tiny little dinosaurs and there are huge dinosaurs. And one really interesting thing with dinosaurs is that the hatchling dinosaurs, they don’t scale with adult body size. Us mammals are born really big. Giraffes can be 200 or 300 pounds when they’re born. Humans are big. I think blue whale babies are like 3,000 pounds. But a huge dinosaur, like the new Patagotitan or Dreadnoughtus, they’re tiny little creatures when they’re born. You can fit a bunch of them on your desk here. And I think what that does for them is they do the jobs of tiny dinosaurs, and then they occupy a sheep size herbivorous niche, and then a cow size, and an elephant size, and then a herd of elephants. So that one species can capture lots of resources from the ecosystem with that growth strategy. IRA FLATOW: Now why did the larger dinosaurs get wiped out, or most of them, and the birds survived? KEN LACOVARA: Well, it’s an interesting question. And we don’t fully understand the terms of their demise, but I can tell you this. 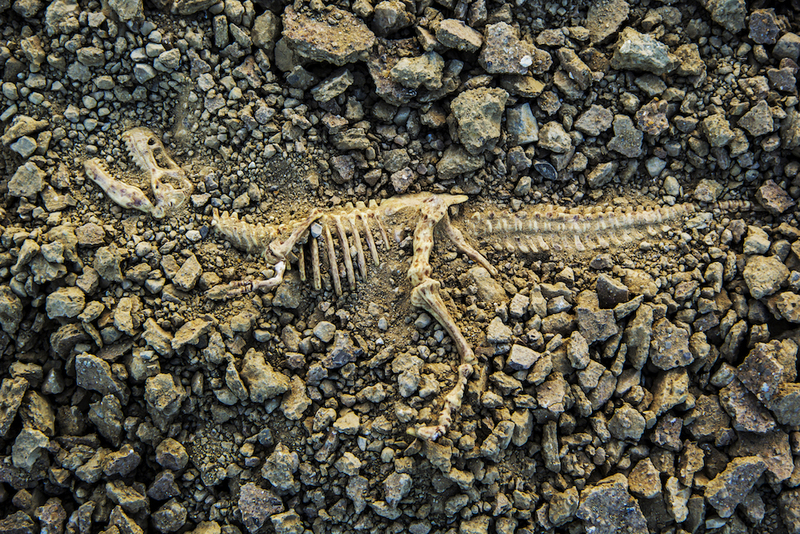 Paleontologists have found many thousands of non-bird, non-avian dinosaurs nests. And every one of them so far is just a crater that some mama dinosaur scraped in the ground and deposited her eggs right on top. So it seems like the non-bird dinosaurs had 100% of their life cycle on the surface of the Earth. We know today that there are some birds that burrow. You can see burrowing parrots in the Amazon, burrowing owls, and penguins burrow, some of them. And so the one group of dinosaurs that survives is the one group that we know for sure has some burrowing members. IRA FLATOW: And you know it’s interesting because you gave a quiz at the beginning of a book. You asked people these four different creatures, which one is a dinosaur? No one gets the penguin. No one picks the penguin. KEN LACOVARA: No one gets the penguin. And I asked people, is a Mosasaur a dinosaur, a giant sea creature. Pterosaurs, like Pterodactyls, that are in every children’s book, are they dinosaurs? Crocodiles? And then I get to the little fuzzy penguin and yeah, no one picks the penguin. But it’s a dinosaur to the same degree that stegosaurus is a dinosaur. IRA FLATOW: There are a lot of fun things and dinosaurs are very popular with everybody. But your book is really fun, but it gets into some serious stuff too, which is that dinosaurs are an important key to studying climate change, right? KEN LACOVARA: Yeah. And you know what I would say there is that really, I think in the public imagination, dinosaurs stand in for the past. And I use them that way in this book. And so when I talk about why dinosaurs matter more broadly, I’m talking about why does the ancient past matter. And the reason I think is we’re all more concerned with the future than we are the past. I think even us paleontologists are. But we don’t have access to the future. As Carl Sagan used to say, no one remembers the future. We can do no experiments in it. So where do we get our information? The only guide that we will ever have to help plot our course into this environmental future that we’re sailing blindly into is by looking in the past. IRA FLATOW: You know it’s funny. We were out west and I’ve been out west all year, and we were in Wichita, Kansas [? where ?] all of the places, meeting dinosaur experts. And I say, well, how hard is it to find a dinosaur out there? And they say, oh, just put the spade in the ground and you’re going to hit a dinosaur fossil really. People don’t realize how many dinosaurs walked in North America. KEN LACOVARA: Well, that’s right. And when you put yourself in the right situation, rocks of the right age that are sedimentary rocks, and today usually in a desert. So you get good exposure, you get yourself on the ground, and you walk, and you will find dinosaurs. IRA FLATOW: And so there are many, many more species than we ever thought. You go to the museum, you see about 10 12 dinosaurs, but there are so many of them, right? KEN LACOVARA: Paleontologists have identified well over 1,000 dinosaur species. And I think, pun intended, that we’ve only begun to scratch the surface. IRA FLATOW: I wish I had thought of that. So would it be fair to say that that age where they were wiped out by the asteroid, that was in extinction period? Are we in another extinction period, do you think? KEN LACOVARA: Well, it seems that way. If you look at the background rate of extinction for the last several million years, there are a number of papers that indicate that the rate recently in the last 100 years has spiked 1,000 times, maybe 10,000 times what we see in the near ancient record. And there’s no doubt if you look at what’s going on with, say, amphibians in Central America and mammals all over the world. We now, Ira, are the asteroid. IRA FLATOW: We are the asteroid. You mean, we because we’re influencing climate change? KEN LACOVARA: Human caused climate change. The CO2 reacts with seawater, it degrades the coral reefs. Sea levels are rising. Biodiversity crisis. IRA FLATOW: Let me go to the phones. Because a lot of people want to talk about dinosaurs. Let’s go to Alan in San Francisco. Go ahead, Alan. Welcome to Science Friday. Let me try it again. ALAN: I am curious about warm-bloodedness. And how birds became warm-blooded, and mammals became warm-blooded, and if there’s an ancient relationship there, or whether it’s convergent evolution, or what’s going on. IRA FLATOW: Good question. What dinosaur is warm-blooded? KEN LACOVARA: Well, we know certainly somewhere because birds are warm-blooded. And we have those today. I don’t know that looking at that question as a binary distinction is the best approach. I think there may have been gradients of warm-bloodedness. And if you’re a really, really big dinosaur, like Dreadnoughtus, I think one of your main metabolic challenges may be shedding heat. And when you look at their bodies, these are the big long neck, long tail plant eaters, they have a tremendous amount of surface area per volume. So they’re kind of like giant radiators. And then they have bird-like lungs. So they have a tremendous ability to exchange heat with the atmosphere. I don’t think we fully understand the evolution of endothermy to get to your question, but it’s probably convergence. I don’t think they got it from a common ancestor. IRA FLATOW: If you’re just joining us, we’re talking about the new book, Why Dinosaurs Matter with Ken Lacovara. I want to also change the subject a little bit. If you weren’t already digging the dino talk, researchers are now saying that the diet of a certain herbivore dinosaur was a little more varied than we thought. When plants didn’t satisfy their nutritional needs these dinosaurs chowed down on crustaceans. And here to fill us in on this unexpected dietary discovery out this week in the journal, Scientific Reports, is Karen Chin, Associate Professor in the Department of Geological Sciences and curator of paleontology at University of Colorado Museum of Natural History in Boulder. Welcome to Science Friday, Karen. KAREN CHIN: Thanks very much. It’s a pleasure to be here. IRA FLATOW: So how do we know that this herbivore also liked to chow down on shellfish every once in a while? KAREN CHIN: Well, we have found the evidence in fossil feces that we call coprolites. And these are pretty exciting finds because actually direct evidence for the dinosaur diet is very rare. We usually have to infer diet from their teeth, and jaws, and the way they stood, and other kinds of evidence. IRA FLATOW: I’m a little afraid to ask this question, but what does dino poop look like? KAREN CHIN: Dinosaur feces actually may not initially remind you of feces because most of them were large animals, as Dr. Lacovara said. So when they deposited feces, they didn’t hold together. They didn’t necessarily have a good shape, or they might have been broken. So it’s actually pretty challenging to recognize them. They look like unusual rocks, so we usually have to figure out how their chemistry or their contents differ from the surrounding sediments. IRA FLATOW: That’s quite interesting. I get why they might be interested in crabs, but I understand that there’s also rotted wood in the feces. KAREN CHIN: Yes, this was a surprising find that we first found in coprolites from Montana about 10 years ago. And at first, this just doesn’t seem to make sense. But when you think about it, if a cow were to eat wood today, it would get very little sustenance out of that because all of the cellulose is complexed complex compounds like lignin. But if you decompose it, then the lignin is released and that the digestibility is increased. So it’s kind of interesting to note that some of the ranchers down in Chile, they will go to very large logs that have been infected by funguses, they’ll cut them open, and the cows will come along and feed on them. So feeding on rotting wood actually would provide some herbivore goodies, or some plant goodies. But I think maybe they were feeding on rotting logs more likely because of all of the fauna that’s often associated with rotting wood. Beetles, and termites, and millipedes, and, in this case, there may have been crustaceans. IRA FLATOW: I’m Ira Flatow. This is Science Friday from PRI, Public Radio International. Talking with Karen Chin and also with Ken Lacovara, author of Dinosaurs Matter. So they’re not ruminants then? That’s my next question. If it had all that wood in there, would they be like cows and chewing on grass? KAREN CHIN: Well, probably not technically ruminants, but they would have been most likely feeding on plant tissues, on leaves, most of the year. Because if they fed on rotting wood all the time, you would quickly run out of the stores of rotting wood. It’s much easier to regenerate leaves than it is to regenerate wood. But we suspect, my co-authors and I, believe that they embarked on this diet to satisfy certain nutritional needs, quite possibly related to reproduction. IRA FLATOW: Sure. If you’re going to have babies, you need certain things for them. KAREN CHIN: You need lots of protein. You need lots of calcium to shell the eggs and protein to provision the yolk inside the eggs. IRA FLATOW: Interesting. 844-724-8255 is our number. Ken, surprising to you that dinos have a big diet? A varied diet? KEN LACOVARA: Well, certainly dinosaur eating crustaceans is surprising. But the kind of work that Karen does provides information that we have no other way of getting. It’s direct dietary information. It’s direct behavioral information. So it’s super useful to all of us. IRA FLATOW: Karen, can we learn other things from the dinosaurs by looking at their feces? KAREN CHIN: We can. We also find evidence of ancient dung beetle burrows. And this informs us how resources were recycled. Because you can imagine, if we were walking about in the Mesozoic, there would be lots of dinosaur dung around. So you would have had to have mechanisms to recycle that dung back into the environment. So yes, they can tell us things about recycling, about diet, and I think it’s quite interesting because if we try to envision how dinosaurs interacted with other organisms in their environment, I don’t think crustaceans and the first thing we would normally think of. So this also sheds light on interactions between dinosaurs and other organisms. IRA FLATOW: One question. A tweet came in. How is feces preserved as a fossil? It seemed as though it would degrade long before it could be preserved, Alex writes. KAREN CHIN: Yes, I was so surprised when I first began studying this to find out that feces actually fossilized. But if you bury them quickly under the right circumstances, and there is a supply of minerals or elements that will help to mineralized something, and then you have the proper bacteria, you can get very rapid mineralization of the feces. But it has to be just the right set of circumstances and rapid burial is key. IRA FLATOW: All right. We’re going to talk more about dinosaurs with my guests when we come back, and our number 844-724-8255 with Karen Chin and Ken Lacovara. Stay with us. We’ll be right back after this break. This is Science Friday. I’m Ira Flatow. We’re talking dinosaurs with Ken Lacovara, author of Why Dinosaurs Matter, and Karen Chin, Associate Professor in the Department of Geological Sciences at University of Colorado Museum of Natural History in Boulder. A lot of folks want to tweet. They’re tweeting and coming in. Here’s a tweet that says– let’s go right to the phone calls. Let’s see if we can go to a phone call. Instead of a tweet, let’s go right to the phone. Hi there, welcome to Science Friday. AUDIENCE: Hi. I have a question about dinosaurs and how they’re related to modern day birds. In popular culture, dinosaurs are always portrayed as the lumbering beasts that are pounded in their feet around and roaring all the time. And I was curious if there any evidence that they actually did make that much noise or vocalize that much, and if that is somehow related to birds nowadays that are constantly calling? IRA FLATOW: Good question. How do we know that dinosaurs were roaring like we think they did in the movies? KEN LACOVARA: Well, I don’t know that dinosaurs could roar. And certainly we know that birds make bird sounds, and ones related to that it seems like they might not have had a larynx like we do, but a syrinx instead. And so it’s quite possible that a T. Rex was making very deep, but bird-type sounds. IRA FLATOW: All right, let’s go to the next phone call. Hi, welcome to Science Friday. Hey there. Glen in Fayetteville. AUDIENCE: Oh, hi. I have a question about Burgess Shale. I learned in school that Burgess Shale i a very unique geological site in finding fossils and I was kind of wondering if there are any other places in the world that are hot spots for fossilization and just finding fossils in general? IRA FLATOW: So where should people go? We were just out in Wichita. It was full of fossils and things like that. KEN LACOVARA: Yeah, that Burgess Shale that you mentioned, which is in Alberta, Canada. That’s way, way before the dinosaurs. That’s over a quarter billion years before the dinosaurs. But hot spots for dinosaur discovery today, the US west is always very good. Patagonia, I’ve done a lot of work there. The Gobi Desert and other parts in China. Northern Africa and actually New Jersey is a pretty good spot. IRA FLATOW: Karen, did you want to chip in there. KAREN CHIN: Well, I agree with Ken on all of that. And he put in a bid for New Jersey. I’ll say Colorado too. The Rocky Mountains, Montana, Texas, New Mexico, Utah, Wyoming– all hot spots, yes. IRA FLATOW: Karen, is it more difficult to find an actual dinosaur fossil or the poo of the dinosaur? KAREN CHIN: It’s much easier to find dinosaur bones than it is to find fossilized feces. I’m sure when you think about it, a dinosaur only died once. So it only produced one skeleton. On the other hand, it defecated a gazillion times during his lifetime. And yet, because of the difficulties of fossilizing the soft materials, it can be very rare and it’s also very difficult to recognize. IRA FLATOW: Ken, you’re shaking your head. KEN LACOVARA: Yeah, I’ve found, I don’t know, I guess thousands of bits of dinosaur bone, and I’ve only found a few coprolites in my career. IRA FLATOW: I understand that you have a big dig you’re going on tomorrow. Tell us about that. KEN LACOVARA: We do at the Jean and Ric Edelman fossil park of Rowan University in southern New Jersey we have 105 acre site there. And every now and then we open it up to the public. And when we open up registration for our community dig day on Saturday, that 2,000 spots filled up in 20 minutes. IRA FLATOW: That’s why you said Jersey. KEN LACOVARA: Yeah, yeah. Dinosaur paleontology started in Britain. That’s where the first remains were recognized. But I would say you know it was born in Britain, but the cradle of dinosaur paleontology was in southern New Jersey. The world’s first substantially complete dinosaur came from South Jersey. The world’s first Tyrannosaur came from South Jersey, and lots of the early discoveries came from there. IRA FLATOW: And where are those discoveries now? Where are they housed? KEN LACOVARA: They are at the Academy of Natural Sciences in Philadelphia. IRA FLATOW: Wow, who would’ve ever thought New Jersey would be a hotbed of dinosaurs? You learn something new every day. We’re running out of time. There’s no better way than to stop talking when you get to New Jersey. One of our great states. Ken Lacovara, author of Why Dinosaurs Matter and the Dean of the School of Earth and Environment at Rowan University. Karen Chin, Associate Professor in the Department of Geological Sciences, curator of paleontology at the University of Colorado Museum of Natural History in Boulder. Thank you both. Fascinating talk about dinosaurs. Good luck with Dinosaurs Matter. KAREN CHIN: Thank you very much. The incubation period for dinosaurs, depending on the species, could have ranged from 3–6 months. Scientists estimate the dinosaur Dreadnoughtus schrani would have weighed as much as a Boeing 737.